When thinking about water leaks in your home, you probably think about roof leaks or pipe breaks, but do you ever think about these less discussed sources of water leaks? You're likely familiar with the most common causes of Water Damage, such as roof leaks, toilet leaks, and pipe breaks, but there are other potential causes of water leaks that can be just as destructive. But where can you find some of these other potential leaks and what can be done to limit the damages they may cause? 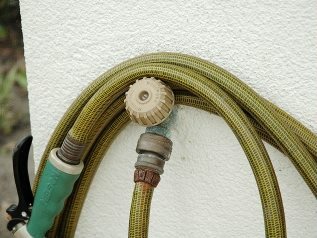 Outdoor Hoses – Cold temperatures or poor connections can result in leaks. As these leaks can occur within exterior walls, they can be particularly difficult to spot. Look for any signs of leaks both inside and outside. 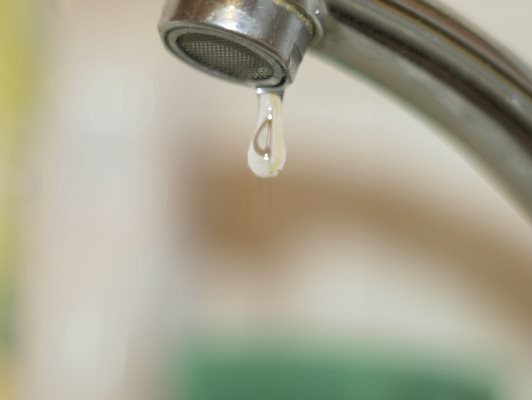 Should you discover a leak, turn off the water to the outdoor faucet immediately, and attempt to determine specifically where the leak is located. Outdoor faucets commonly leak as a result of loose connections, which can generally be repaired by replacing the washer or tightening with a wrench and pipe tape. If the leak is a result of a broken pipe or any other cause you are unable to repair yourself, contact a plumber able to perform the necessary repairs for you. If the leak resulted in interior water damage, contact a Local Mitigation Company such as Disaster Blaster, able to properly dry the structure to prevent further damage and mold growth. 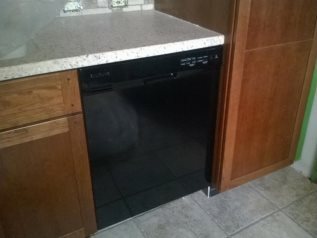 Dishwasher – Causes of dishwasher leaks can be weak connections, unlevel drains or basins, or doors that don't shut correctly. Should you ever notice water collecting near the base of your dishwasher, turn off the dishwasher immediately and attempt to determine the cause of the leak. Leaks caused by doors that don't shut correctly can generally be repaired by replacing the dishwasher's gasket, while leaks as the result of weak connections can be repaired by tightening the hose connection. 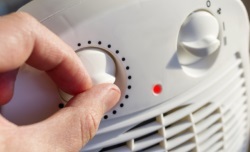 Other causes may require a professional or even replacement of the unit. 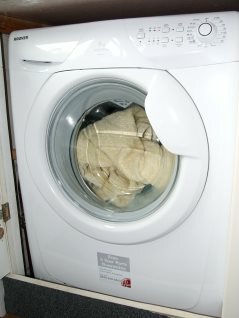 Washing Machine – Leaks from washing machines are generally caused by broken washing machine hoses, worn seals on front-loading washing machine doors, or drainage issues. It is recommended to replace washing machine hoses about every 5 years (steel-braided hoses are well worth the investment). In cases where the water is leaking from the door seal, replacement of the gasket can solve this. 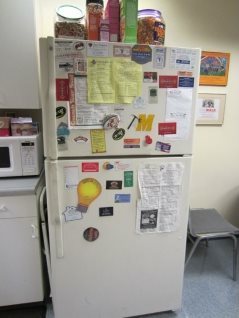 Should the leak persist, or be undeterminable, consult a professional. Air Conditioner / HVAC – The most common cause of a leak from an air conditioner or HVAC is poor drainage, however improper installation or ice accumulation on the evaporator coils can also lead to leaks. 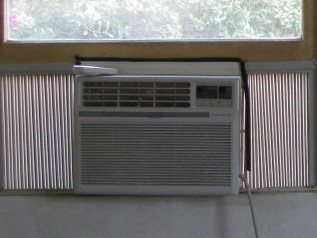 Air conditioner leaks can often be resolved by adjusting the unit, which depending on the unit may require a professional. Radiators – Being under pressure, a radiator leak can result in significant damage, and while you may shut the water off quickly, they will generally leak until there is no longer pressure in the lines. For this reason, radiator leaks can result in significant damages. While radiator leaks can occur suddenly, watch for smaller leaks or weakened connections. A professional will be able to repair or tighten connections, and even test the psi of the system, allowing you to determine if this is within an acceptable range. Higher than normal psi pressure can lead to ruptures or damage to the radiators during use. Often, causes of water leaks can go unnoticed until significant damage has been caused. While we at Disaster Blaster are happy to assist you should you suffer a Water Damage, we hope these tips help someone avoid unnecessary water damage at their home! Should we be of assistance to anyone, please do not hesitate to Contact Us!